Luiz Felipe Scolari has left a decision on his future as coach of Brazil to the country’s federation after the World Cup hosts’ campaign ended in more disappointment. “It is up to the president to decide. 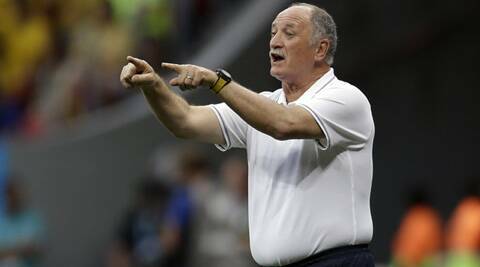 We will hand in a final report and then leave it to him to analyse what needs to be done,” said Scolari after Brazil lost 3-0 to the Netherlands in the third-place play-off in Brasilia Saturday. Scolari’s contract with the Brazilian Football Confederation (CBF) expires with the end of Brazil’s campaign but there have been suggestions that president Jose Maria Marin could persuade him to stay on until the end of the year while a long-term replacement is sought. Saturday’s loss came on top of Tuesday’s 7-1 mauling by Germany in the semi-final in Belo Horizonte, but Scolari maintained that there were plenty of positives from a World Cup in which Brazil finished fourth. “At the end of the tournament we were not so good but we finished fourth and we must praise the players. The game (against Holland) was very even but we conceded a goal early on and the Netherlands got the breaks,” he said. Brazil fell behind when Thiago Silva gave away a second-minute penalty for a foul on Arjen Robben and Robin van Persie converted from the spot, before Daley Blind and Georginio Wijnaldum added further goals at the Mane Garrincha National Stadium. The home players were loudly jeered as they made their way off the field having become the first Brazil team to lose successive home games for 74 years. But Scolari claimed that Brazil’s campaign was about more than a first-half collapse against the Germans in the semi-finals and continued to insist that his players deserve more merit for their victory in last year’s Confederations Cup. “There were really good moments in games. We can only lament a six-minute spell against Germany, but it happened and today (Saturday) I can’t criticise the team. And Scolari defended his own track record, pointing to his past successes as coach of the Brazil team that won the World Cup in 2002 and of the Portugal team that also finished fourth in 2006. “I have been in three World Cups, two with Brazil and one with Portugal, and in all of them I have got to the semi-finals,” he said.